The anguish against Citizenship Amendment Bill is increasing day by day among the people of North East region. The level of their anger has reached at its peak. It has increased to a level that these youths have started chanting slogans against India. Last week, on Wednesday, thousands of youngsters in Mizoram protested the Citizenship Amendment Bill in various towns of the state. Many of them held banners that read, “Hello China, Bye Bye India”. According to the sources, similar rallies have been held in Guwahati. 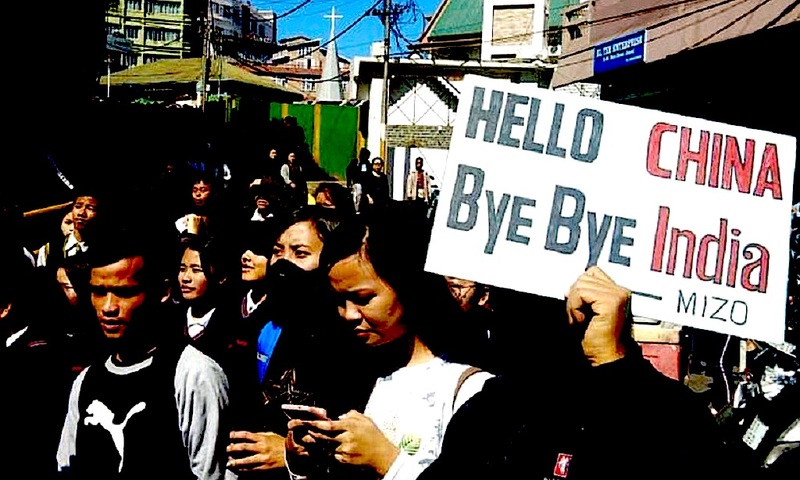 During the protests, Mizoram’s most influential student body, Mizo Zirlai Pawl, went to the extent of saying that they are starting to think if it is instead better to seek assistance from China. They complaint that India does not hear them and have no concerns for them instead it gives preference to the illegal migrants over them. “If the plea of the Mizos are constantly disregarded, then youths will have no other way than to pick up the gun. We might be compelled to pick up arms,” he added. In Mizoram, its powerful NGOs including apex students’ body Mizo Zirlai Pawl MZP and Young Mizo Association (YMA) also boycotted the Republic Day of India function against the attempt to pass the Citizenship Amendment Bill. It is important to note that the mainstream media of India has easily afforded to ignore this news where the youth are giving ‘anti-national slogans’ like “Hello China, Bye Bye India”. This mainstream media chose to keep silent on this issue of grave concern for the integrity of India. This much intensity of the anger against India should awaken the government to look at the problems these people find with Citizenship Bill because it is dangerous for the unity and integrity of India. Related Items:Citizenship Amendment Bill, Why the Youth of North East Gave “Hello China Bye Bye India” slogan?